INCLUDED 4 Drip trays Available in Black color only. Capacity 8,000 lbs. Lifting Height 72.5"
Overall Length w/Approach Ramps 207.5" Overall Width (with motor) 115"
Overall Width (without motor) 103-1/2"" Overall Length without Approach Ramps 175.5"
Approach Ramps 32" Runway Width 18.5"
Runway Length 169.5" Runway Thickness 4-1/2"
Clearance Between Columns 94" Drive through width (Outside of tire to outside of tire) 80-1/2"
Height of Columns 81.5" Clearance Between Runways 38"
Outside Runway to Outside Runway 75" Clearance Under Runways 68"
Power Unit 110 Volt, 1HP Shipping Weight 1,820 lbs. 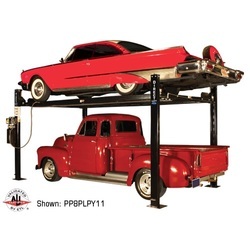 The Pro Park 8 PLUS LONG four post lift combines the advantages of the Pro Park 8S and 9 PLUS. 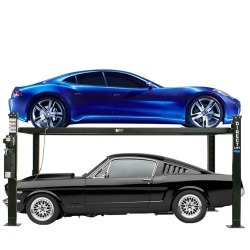 The Pro Park 8 PLUS Long provides the perfect solution for increasing parking space without having to resort to any permanent changes to your shop or property. 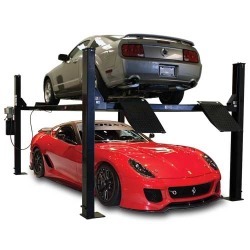 This car hoist allows you to double your parking space instantly, and is a versatile tool which can be used for any automotive lift and storage needs. Overall Length w/Approach Ramps 226"
Overall Width (with motor) 121" Overall Width (without motor) 109.5"
Overall Length without approach ramps - 194" Approach Ramps 37"
Clearance Between Runways 38" Outside Runway to Outside Runway 75"
​ Shipping Weight 2020 lbs. Capacity 9,000 lbs. Lifting Height 84"
Overall Length w/Approach Ramps 225.5" Overall Width (with motor) 131"
Overall Width (without motor) 121.5" Overall Length without approach ramps - 183-1/8" Approach Ramps 36.25"
Runway Width 21.75" Runway Length 184.5"
Runway Thickness 4.75" Clearance Between Columns 109-1/2"
Drive Through Width (Outside of Tire to Outside of Tire) 97" Height of Columns 97"
Clearance Between Runways 39" Outside Runway to Outside Runway 79.5"